Hello! My name is Devon Stancil and I am a Senior Sales Associate here at Music & Arts in Rockville, MD. My principle instrument is Alto Saxophone which I have been playing for nearly 30 years. I have a Bachelor's Degree in Music Theory & Performance from Virginia Tech. I also play a little piano, electric bass, flute, and clarinet, and I am familiar with all the band and orchestra instruments. Any questions you have, I am eager to answer them! 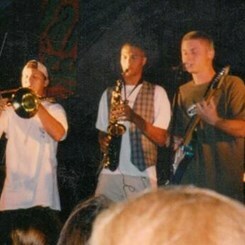 I started playing saxophone in 6th grade and excelled from the start. In high school, I was section leader in the symphonic and marching band my junior and senior year. We were one of Virginia's only Honor Bands all 4 years of my high school career. During my college years, I played in numerous ensembles at Virginia Tech including The Wind Ensemble, The Symphony Band, The Commencement Band, The Saxophone Quartet, and Virginia Tech's Jazz Orchestra, conducted by the well-known artist Chip McNeill for my first 2 years in Blacksburg. I also toured the East Coast for a few years with my ska/fusion band Baker. We played mainly on the college circuit playing at schools such as Virginia Tech (of course! ), University of Virginia, Penn State, Bucknell University, University of North Carolina, East Carolina University, and NC State. We also played in large venues including Trax in Charlottesville, VA, The Flood Zone in Richmond, VA, Innsbrook Pavilion in Richmond, VA, Peabody's in Virginia Beach, VA, and the 9:30 Club in Washington, DC. We released our first album entitled "Upbeat Stepper" under BOB Records, a subsidy of Caroline Records at the time. I am new to the Music & Arts culture, but have quickly realized that this is the place to go for ALL of your musical needs. We have an extensive selection of print music and accessories for everything from bass clarinet to ukulele. We are the nation's largest provider of private lessons, teaching over 1.5 million per year! And of course, when you are ready to rent an instrument for your child, or just want to rent and learn a new instrument for yourself, we are your one stop shop for that too! I look forward to seeing you in the store and satisfying all of your musical cravings!